In the very early days of railroading, employees did not wear uniforms. Rather they wore the business attire of the day, including perhaps a top hat. However, according to Baker & Kunz, “…when trainmen did not wear a regulation cap or uniform, so many problems arose that they began to affix an identification badge of some sort to their regular hats and coats. Before long...all employees – passenger conductor, brakeman, station agent,baggageman,porter, police officer, down to the waiter-coach attendant and cook – came under the Rules and Specifications Governing the Uniforming of Employees, which stated that ‘employees on duty must wear the prescribed badge and uniform, and be neat in appearance’ (pp 163-164). In time the railroad uniform came to symbolize the entire industry and was a source of great pride among employees. When railroad employees had formal portrait photos taken, many chose to appear in their full railroad uniform, sometimes with a railroad lantern as an additional indication of their status. Nowadays, uniform items are a major focus of railroadiana collectors. These items include badges, buttons, hats, and of course, the uniform itself. Some collectors specialize in one of these subcategories. For example, uniform buttons were usually customized for individual railroads, were often quite ornate, and are easily displayed and stored, so many collectors focus on acquiring as many different uniform buttons as they can. But the “big prize” in this general area is the uniform coat which not only serves as a display for buttons and badges, but also speaks directly to the human aspect of railroading. Unless the coat is new old stock, it was worn by a real employee with a personal history (usually unknown), and therefore serves as a direct connection to someone who lived and worked in an historical era of railroading. The uniform coat shown on this page is particularly unusual and interesting. First, it was worn by an employee of an interurban line rather than a more common steam railroad. The interurban was the Lackawanna & Wyoming Valley, also know as the “Laurel Line.” According to Tom Stranko, "The L&WV name was incorporated in March of 1903. The charter was basically to run passengers and freight better (faster and cheaper) between Scranton & Wilkes Barre with freight interchanges with several major railroads (Delaware, Lackawanna & Western, Delaware & Hudson, Lehigh Valley). The Westinghouse Company was involved in construction and financing the electric-powered, third-rail DC operation. As with many other interurban railroads, the depression and the coming of the automobile age was their downfall. The L&WV was 75% owned by the DL&W by 1956 and was gone for all intents and purposes as an independent carrier having run as such about 60 years." Another feature of this coat is its rarity. Since it came from a small regional operation rather than a major trunk line, there simply weren't many such coats to begin with and very few that have survived. As with virtually all railroadiana, items from regional lines are rarer because there were fewer of them in the first place. Since uniforms wore out like any other clothing, most were simply discarded when the time came. 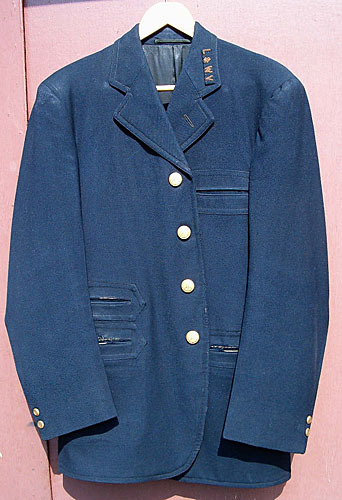 This coat likely dates to the early part of the 20th century, and in general, railroad uniforms from 70+ years ago are uncommon. Yet another unusual feature of this coat is its style and number of specialized pockets. These pockets were likely used for storing items used by the owner -- ticket stock, a punch, schedules, money, etc. 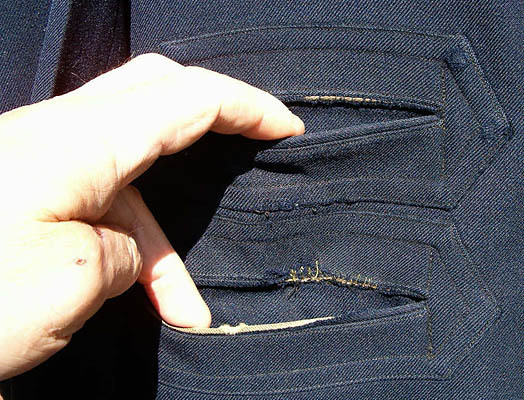 The style and number of pockets suggests that it was specifically made for a railroad conductor. Tom's story of the coat is also interesting. "I bought this uniform coat at [a] railroad auction in Scranton, Pa. in 1990. The thing about the coat was that it had the lapel insignia and the 4 sleeve buttons but no front coat buttons. Years later I got one coat button, but it was just this month that I traded for the other three buttons I needed." So the coat that we see now is in better shape than it's been in many years and is actually something of a restoration. Following are close ups of various parts of the coat, as well as another Laurel Line item that is also connected with uniforms. Above left to right. 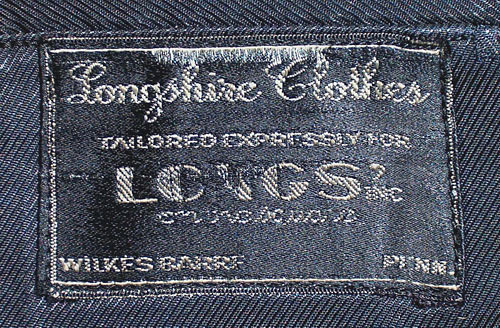 Close ups of the manufacturer's label, front button, and lapel insignia. Below, left to right. Close ups of the sleeve buttons and pockets. 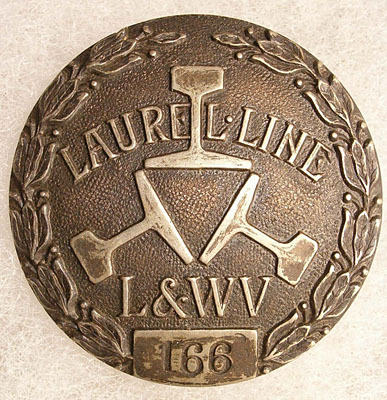 Also shown is a breast badge (not from the coat but a great uniform item from the Lackawanna & Wyoming Valley). Click on any image, including the full coat picture above, for a larger version. Thanks to Tom Stranko for information & photos!